GAMBIT: Updates: Snap Escape nominated for the Mochi Awards! Snap Escape nominated for the Mochi Awards! Snap Escape has been nominated for "Best Social Game" for the Mochis, an industry award for the Flash game industry! The award show will be held in San Francisco on March 8th as part of Flash Gaming Summit 2010. 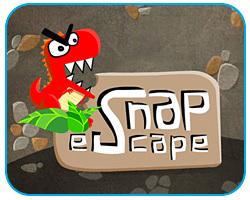 Snap Escape is our follow-up to Picopoke, our IGF Mobile finalist in 2009. Like Picopoke, you upload photos into the game and vote on photos submitted by your friends. Only now, you get to go shopping... and run from dinosaurs! Snap Escape was developed by alumni of our GAMBIT Summer Program, working for 4 months from the Singapore lab. All you need is a Facebook account and Flash, so sign up for free and start playing, or vote for Snap Escape as your choice for the Mochis People's Choice Awards!